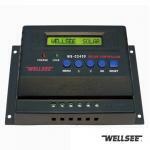 WS-SC2440U 20A 12/24V wellsee solar three stage charge and discharge controller_Solar Controller_Products_solar controller,charge controller,solar regulator,lighting controller,mppt controller are selling best on our website! 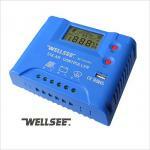 Wellsee company is one of leading manufacturer and global supplier of wellsee solar controller and photovoltaic equipments. Wellsee products have passed ISO9001, CE and RoHS certificates, and can be designed and produced according to the customer’s requirement. Welcome to be our agent! Wellsee Solar PV prodcudt have more than 80 varieties, with its advanced technology, excellent quality, first-class service win buyers’long-term trust and support. The popular models in domestic :solar controller, vertical axis wind turbine, solar inverter are hot selling in United States, Australia, Africa and total 112 countries. 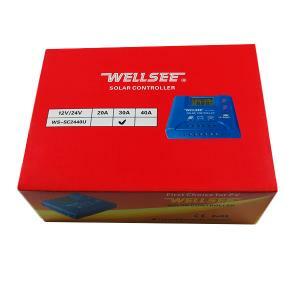 Wellsee products play important role in both domestic and international photovoltaic engineering construction, earn the industry peer’recognition and praise. 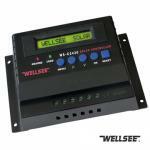 New model WS-SC2440U wellsee three-stage solar controller ,continues the success of the three-stage charge and discharge.The newest feature is the large LCD display, real-time monitoring of high efficiency for charging and discharging data of voltage, current and power statistics. With USB interface, can be convinient to charge for mobile phones or tablet, three stage power can be adjusted.The new type U series products use PWM pulse width modulation technology, make it become a low loss series type charging controller. 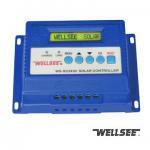 WS-SC2440U wellsee three-stage solar controller (also called wellsee photovoltaic controller /solar charge and discharge controller ), applies in solar photovoltaic system which coordinates the working of solar panels, batteries and loads. 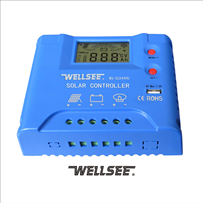 This controller is different from other solar controllers which has advanced three -stage charging function that can make battery fully charge battery and also increase the comprehensive protective functions so that the entire system can operate efficiently and safely. Wellsee three -stage solar controller is totally different from other controllers with three stage charging mode:it charges by battery charging characteristic curve and adopts to intelligent three steps charging mode “constant current- constant voltage and limited current-Purling floating”,It make the battery full of power and it has advanced human-machine interactive function that user can adjust charging voltage. 3. Purling current floating charge stage: continue to control by PWM and keep the charge current keep in floating status until battery voltage is up to 14.2V, charging is over. If the started voltage of battery is higher than the lowest protection voltage, the system will go to the Purling current floating charge stage automatically to prevent frequent overcharging; if started charge voltage is lower than the lowest protection voltage, the system will go to three-stage charge mode. Three-stage charge mode uses constant current charging at the beginning and the end, and uses constant voltage charging in the intermediate stage. When the current is decayed to the set value, it switches from the second stage to the third stage. This mode can make the outlet minimum to protect the battery better and really charge the battery fully. 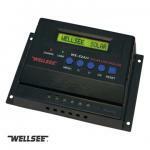 WS-SC2440U Wellsee three-stage solar controller applies to all types of solar panel and lead-acid batteries (Other types of batteries could customize charging curve according to the users) . Adopting industrial grade MCU (Micro processing controller) has PWM (Pulse Width Modulation) program with variable duty cycle functions. It can provide fast and best charging voltage and current from the PV panel according to different types of batteries and charging state. •USB port for charging your mobile phone or tablet. 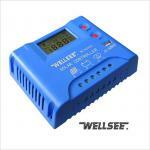 •Temperature sensor for charging a battery in compensation.